Captain, Good work. 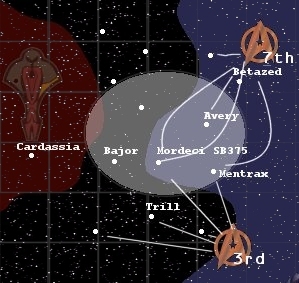 By securing Mordecai we have a good base of attack into Cardassian territory if needed. However, the attack can hardly be considered a success. 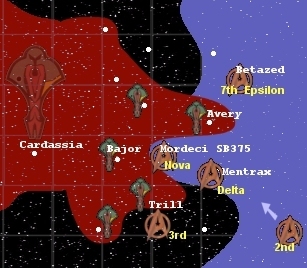 Alpha, Epsilon and Delta squads were ambushed by Cardassian Fleets. A squad of Cardassian Fighters launched an attack on Betazed drawing ships back to defend the System. Because of these attacks our squads were under-powered and we were unable to take Avery. This has divided the 7th fleet in two. The 3rd fleet was hurt just as bad. Their mission to cut off supply lines was met by two entire fleets based in Bajor. They have fallen back to Trill and D'lor. 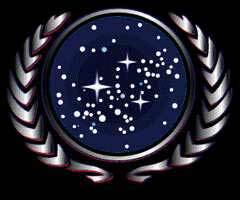 They entire Federation Fleet is split into 3 fronts, with 2 massive gaps that could allow Cardassian attack deep into Federation territory. We must now hold our positions. The 2nd fleet has been mobilized and will be reinforcing us, but it will take them nearly 4 weeks to get into position. Captain, with Captain Fitzgeralds death, and the massive loss in Alpha, I have decided to merge Alpha and Nova, Under your command. Your orders are to hold you position. If Mordecai were to fall again, we would not be able to stop them from entrenching their position like they have on Bajor. This would put Betazed, Altair, and even Andoria in danger of attack. We have been receiving some intelligence from inside Cardassian space. This vessel is a new Cardassian Battlecruiser, its Identified as a Galor Class vessel. 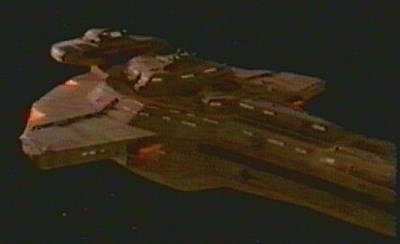 It closely resembles the current cruiser fielded by the Cardassians. Its weapons and power systems however, do not. If the intelligence we are receiving is correct it could easily over power the Excelsior 'A' Type as well as our Miranda vessels. It is not known whether or not they are as of yet in service. Either way we are moving as many Excelsior 'B', Ambassador, and the new Nebula class vessels to the front as possible. If you are to encounter these vessels, immdiatley call for assitance. These vessels are more than a match for the vessels we currently field. The USS Mordecai that was supposed to be the new Flagship for this region should be arriving soon, you will take command of this vessel when she arrives.